Leonidas Kavakos performed Prokofiev's Violin Concerto No. 2 with the Boston Symphony Orchestra. Boston Globe: "But it was the modicum of extra heat and intensity he brought to the rhythmically feisty finale that raised this performance up a few notches in excitement." 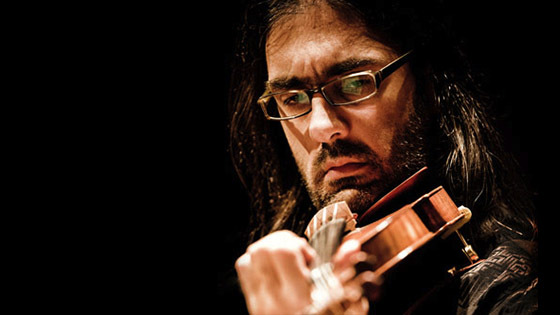 The Republican: "Kavakos delivered a fascinating performance of Prokofiev's mercurial second violin concerto." The Boston Musical Intelligencer: "Kavakos bravely projected a sinewy and precisely focused but not overly large sound, rather than digging in for relentlessly broad but less subtle effects. He demanded no spotlight. Well-judged rubato, expressive and highly varied vibrato were two small but sovereign arrows in his distinctive interpretative quiver. His dead-nuts intonation, like that of Heifetz, Milstein, and Kremer, permits effective projection even in quiet expression." Violinist.com: " The fifth movement was where everyone hit their stride." Los Angeles Times: "(Heyward) then settled down for the Serenade, allowing Hahn, who performed the piece from memory, to conjure some of her warmest, most autumnal and, when appropriate, spikiest playing." Gil Shaham performed the Mendelssohn with the Chicago Symphony Orchestra. Chicago Classical Review: "The violinist brought his singular combination of sweet, singing tone and easy virtuosity to this uber-familiar music–as well as his quirky, restless stage presence." Chicago Tribune: "Shaham appeared to be out to set new land speed records for the concerto. All three movements were faster than usual, amazingly well played, to be sure, with bright, sweet tone. But where was the lyrical charm and, in the finale, the puckish fantasy?" Lisa Batiashvili performed Hillborg's Second Violin Concerto with the BBC Symphony Orchestra. The Arts Desk: "In effect much of the one-movement concerto was searing cadenza from the compellingly intense Batiashvili." The Guardian: "...the concerto does make a fine showcase for Batiashvili’s fearless playing, which is so tonally rich and technically immaculate. Hillborg had provided her encore, too – a violin-and-orchestra arrangement of a Bach chorale prelude that gave everyone even more opportunity to wonder at the faultless purity of Batiashvili’s playing." Listen to this concert for the next month on the BBC iPlayer. Nicola Benedetti performed Szymanowski's Violin Concerto No. 2 with the New World Symphony. South Florida Classical Review: "Benedetti exhibited an affinity for the score’s allusion to gypsy fiddling and seemed to grasp the work’s more poetic imagery but lacked the necessary polish." Tai Murray performed the Mendelssohn with the Jacksonville Symphony. The Florida Times-Union: "Soloist Tai Murray is a force whose range and color of tone seems boundless. With commanding presence and infectious confidence, her intonation never strayed, even in passages of fastest filigree." Augustin Hadelich performed the Dvorak with the Royal Scottish National Orchestra. Edinburgh Guide: "Hadelich relished it and Peter Oundjian took no time in encouraging him to give an encore: the Andante from Bach's Second Sonata." The Scotsman: "By and large, Hadelich’s refined presentation and anchored gait tempered the work’s bubbly exuberance with controlled excitement, all satisfyingly to its benefit." Arnaud Sussman performed the Mendelssohn with the Buffalo Philharmonic Orchestra. The Buffalo News: "Sussman played with accuracy and lightning-quick virtuosity." Timothy Chooi performed Lalo's Symphonie Espagnole with the Okanagan Symphony Orchestra. Summerland Review: "His technical passages were effortless, and his fingers flew up and down the fingerboard with trills so fast they sounded like harmonics." Rosanne Phillipens performed the Sibelius with the Ulster Orchestra. Belfast Telegraph: "Rosanne Phillipens, standing in for the indisposed Esther Yoo, rose to the occasion superbly on Friday evening and deservedly received a prolonged standing ovation." Annelle Gregory performed the Korngold with the Santa Monica Symphony. Santa Monica Mirror: "The young and brilliantly talented violin soloist Annelle Gregory performed the Korngold violin concerto with the Santa Monica Symphony." Please support music in your community by attending a concert or recital whenever you can! December 7, 2017 at 03:18 AM · Thanks for the link to Batiashvili’s Hillborg concerto. Fine listening.